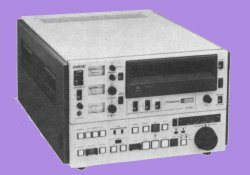 The BVU-800 is a High band U-matic. It offers high picture quality and editing capability. It is possible to remote control a second machine from the front panel. Remote interface is via 9-pin RS422 and 36-pin connectors.